Of the nearly 400 different species of birds that can be found in Iowa, whether common or rare, a number of them can only be seen when they are migrating between their summer breeding grounds and their wintering grounds. Even though Canada geese can be seen all year round in Iowa, their classic V-formation flights often seem to signal the changing of the seasons and the migratory period for a wide number of birds. Greater White-fronted Goose (Anser albifrons): A medium sized goose, with a small bill, short neck, and stocky legs, the greater white-fronted goose can be found foraging in wet sedge meadows, lakes, ponds, and wetlands. They are mostly brown and have a pinkish-orange bill. Snow Goose (Anser caerulescens): A medium sized white bodied goose with black wingtips that are barely visible while the goose is on the ground, but noticeable in flight. There is also a blue morph, which has a white face and a dark brown body. During migration they particularly like agricultural lands and will feed on waste grain, though they are also found marshes. American Wigeon (Mareca americana): A dabbling duck, the American wigeon spends most of its time during migration on marshes, inland lakes and ponds. It eats a wide-variety of aquatic plants, but is also known to steal food from coots or diving ducks. It is known by its distinctive white crown. Northern Shoveler (Spatula clypeata): A dabbling duck, with a distinctive large spoon-shaped bill. It will occasionally breed in northern Iowa. It prefers alkaline lakes, fresh marshes and shallow waters. It can often be found on stagnant or polluted waters that are not preferred by other ducks. Northern Pintail (Anas acuta): The males are easily identifiable by their long and pointed tails; though present on all northern pintails it is most prominent on the males. They have an elegant slender profile and their wings are long and narrow in flight. Green-winged Teal (Anas crecca): The smallest dabbling duck in North America. During migration they are generally found on shallow wetlands. 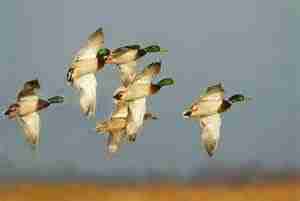 During flight it is possible to see the green wing patches that both sexes have. Males are grey with a chestnut head and green streak whereas females are brown. Canadian Geese north of Forest City. Canvasback (Aythya valisineria): The largest diving duck. Males have a chestnut head and neck, a black chest and rear, and a white body. Females have a light greyish body and a slightly darker head, chest and rear. During migration it can mostly be found on large lakes. Ring-necked Duck (Aythya collaris): A compact diving duck with a unique head shape – a sloping forehead and a peaked rear crown that flattens when diving. During migration they can be found on ponds, lakes, or slow-moving rivers. Lesser Scaup (Aythya affinis): A medium sized diving duck that migrates relatively late in fall. From a distance the males look black and white though a closer view reveals an iridescent purple or green sheen to the head. When out of breeding season the males have grey brown body and a black head. Females are brown all over with a dark head. Bufflehead (Bucephala albeola): A small duck that is less sociable than most other ducks. It is almost never seen in large flocks and instead prefers small flocks or traveling in pairs. Its name comes from the term “buffalo head,” which refers to the odd puffed shape of the male’s head. Red-breasted Merganser (Mergus serrator): Very similar to the common merganser, which overwinters in Iowa, but nests further north and winters further south. Both males and females share a shaggy head. Ruddy Duck (Oxyura jamaicensis): Known in summer and spring migration for the male’s bright blue beak, in the winter and fall migration its beak is grey. It has a dark cap and a solid white cheek.